“As an advocate of online privacy, I’ve issued numerous warnings on how easily Internet users can bypass the supposed protections on social media. In this latest installment, I’m going to begin by informing you that… brace yourself… the Account Protection feature on Twitter does NOT retrospectively protect your tweets. 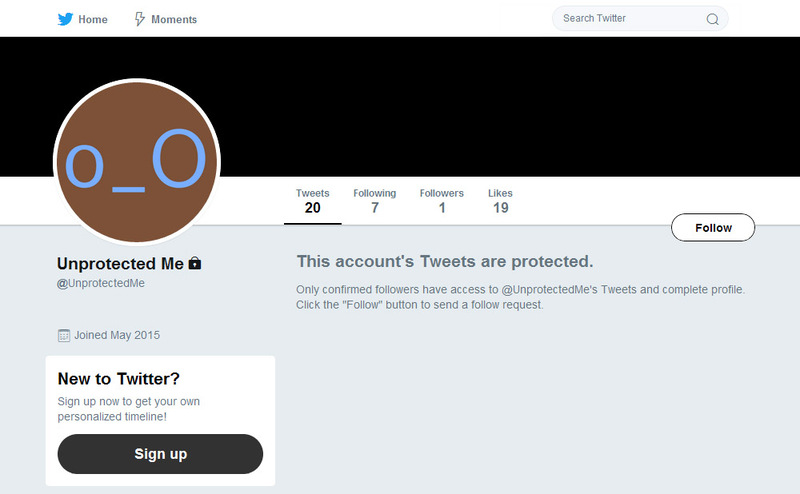 What do I mean by that?… Well, if you decide, today, that you no longer want your tweets to be visible to non-followers, some of the tweets you posted before ‘protecting’ will still be visible online after you add ‘protection’. In fairness, tweets you post after protecting will be confined to your group of followers, but we’re now going to see how easy it is for any web user to access and view your pre-existing tweets. I’m assuming you’re a Twitter user with a public account. But if you’ve already ‘protected’, just skip Step 1. 1. Go to Twitter and protect your account. Cool, man. Only your followers can now see your tweets… NOT. Make sure the fomatting is exactly as it appears above, with no spaces. 3. Now simply replace ‘your_username’ with your actual username. Make sure you have NOT added your username’s “@” symbol, and hit enter. Whhoooooaaaaaa! !… Okay, so your tweets are coming up in search, and people might be able to see some of the tweet text in the titles of the Google results. Well, they will if they click the main link on the Google result. But Google doesn’t just offer links to the original tweets. It also stores pages in its own duplicate cache. And the cache is not immediately cleared when a Twitter account is protected. In fact, it can be a very considerable period of time before Google clears its cached data. I checked some Twitter accounts that were protected four months ago or longer, and found there were still tweets remaining accessible in Google’s cache. Not very effective, this ‘protection’ thing, is it? Okay, so you may have noticed that the results on Google are not chronological, and individual tweets don’t appear in the same order as they would on Twitter. So, that makes it harder for people to isolate your most recent tweets, right? Google will find any tweets it’s indexed from that day. True, this is slower than scrolling through a Twitter timeline, and it’s harder work, and whether you’ll find any tweets at all depends on whether Google indexed them. Google is less likely to regularly index erratically used accounts with low engagement. But high profile accounts with a high level of activity and engagement will typically be indexed frequently. The ultimate point is that people will still be able to find and access tweets you posted before protecting your Twitter account – potentially even when your account has been protected for months. Whether you blame Google for the way its site works, or blame Twitter for not being clearer about the reality of the protection feature, is up to you. But the advice is clear. Don’t think that protecting your Twitter account will automatically insulate you from the prying eyes who want to explore what you’ve said in the past. The Internet loves harvesting your data, and it takes a lot longer to forget than to learn. When the first is not really the first, where did the REAL first go? You can find more about the ways in which people can spy on your protected Twitter account in Protected Twitter: I Read You Loud & Clear.